I get thank you messages from happy clients on a regular basis. 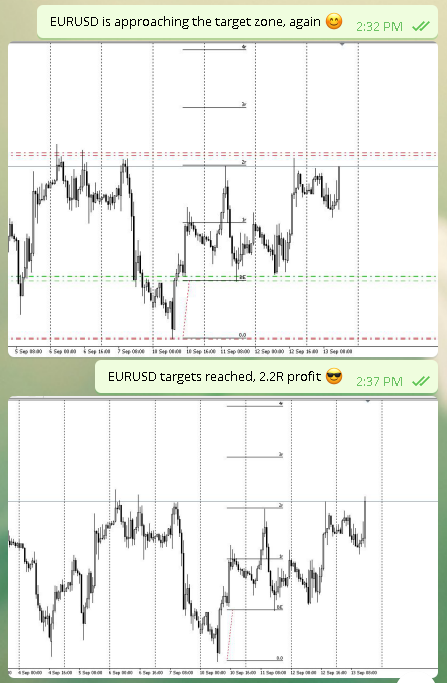 With the following two screenshots I can show you one example a successful trader. 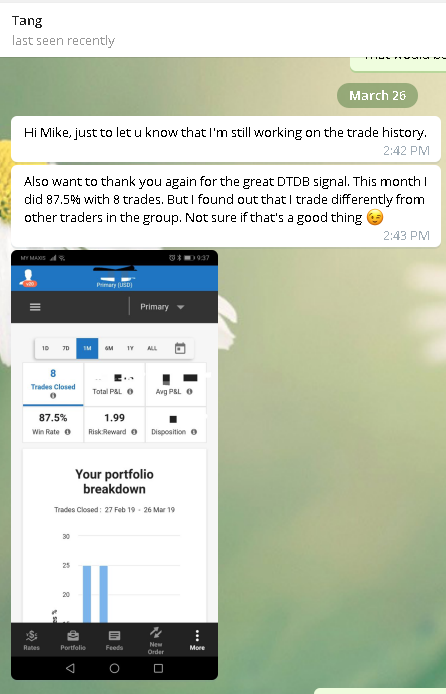 This guy (his name is Tang) trades the Double Top/Bottom concept since 5 months in a row successfully with a winning percentage of up to 87.5%. 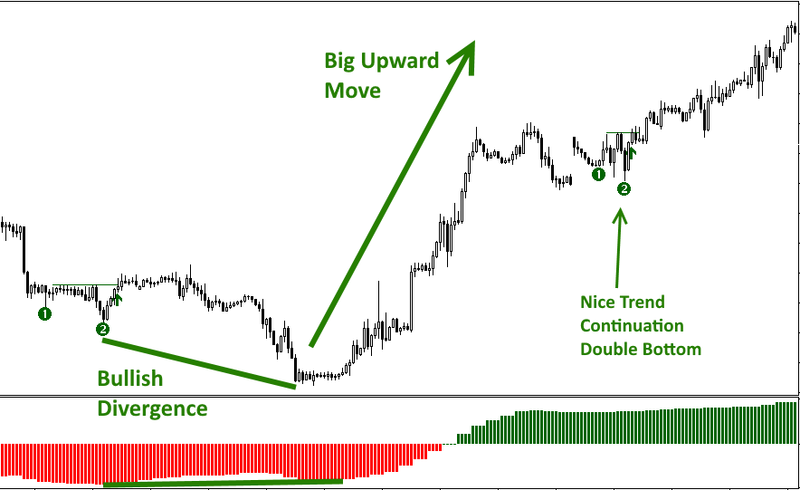 This shows you that learning the concepts to select the best signals is as valuable as gold. 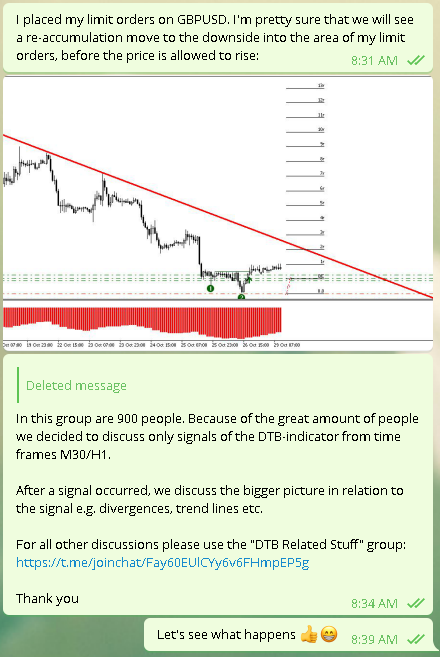 Yesterday someone in the DTB-group asked when the recent Double Top/Bottom within a divergence occurred. Such setups have a very high success rate and they are one of our default trading setups. 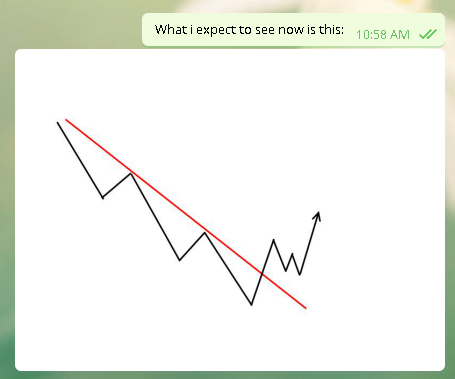 When you get such a signal then you need to check if there is enough room for a big potential move until the rising trend line is reached. 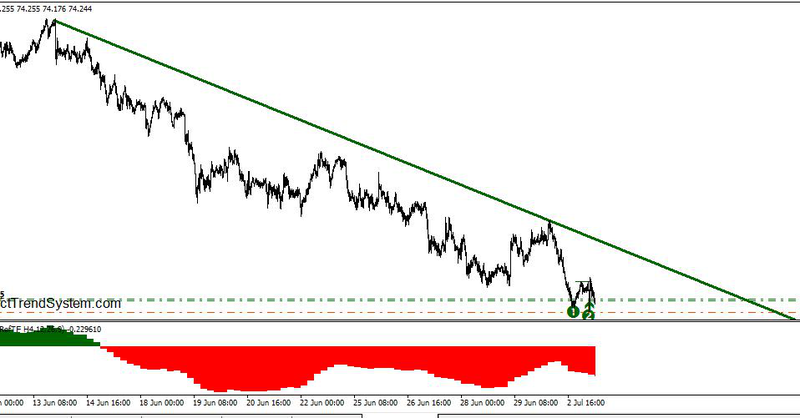 Yesterday was a nice and very profitable double bottom signal on USDCAD M30 directly at a rising trend line. 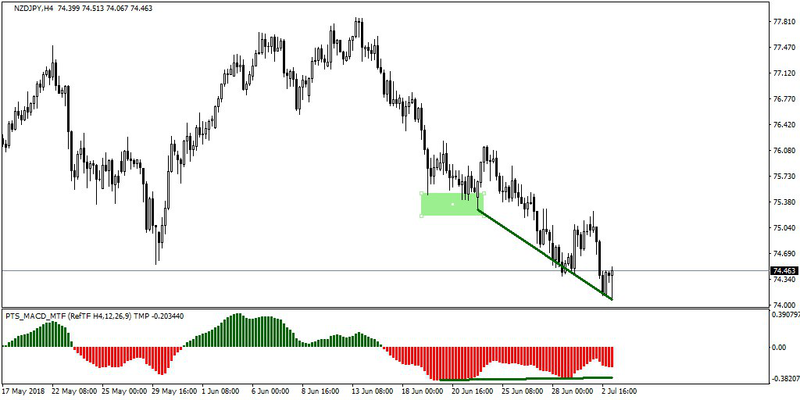 Such setups have a very high success rate of around 75%. 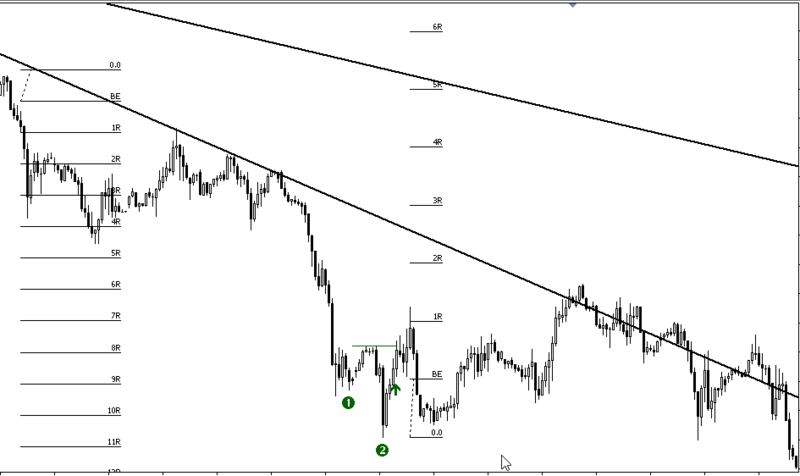 This example shows you the power of signals that occur directly at and in direction of trend lines. 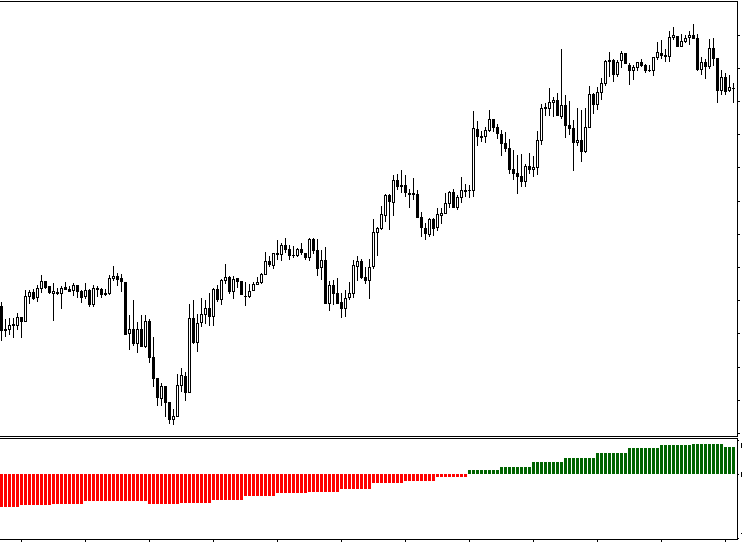 You could have also traded a V-Power entry exactly at the same price level. 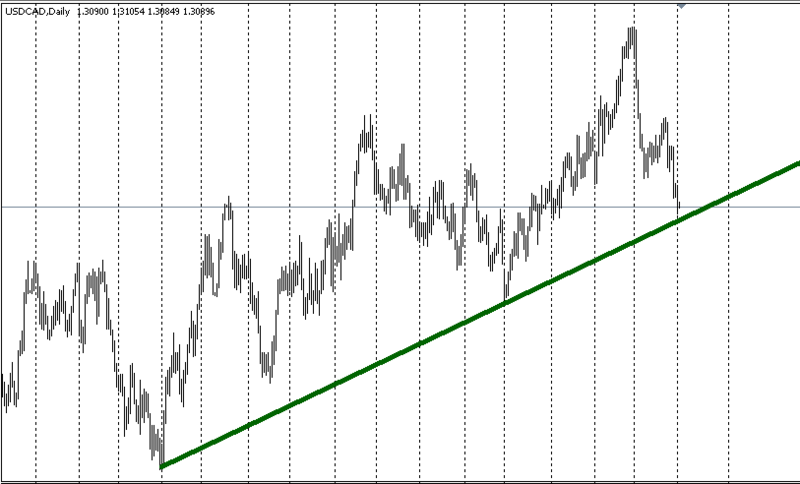 The same trend line was also a key component of my analysis on investing.com some weeks ago. I wanted to post regularly on investing.com to get more outreach. 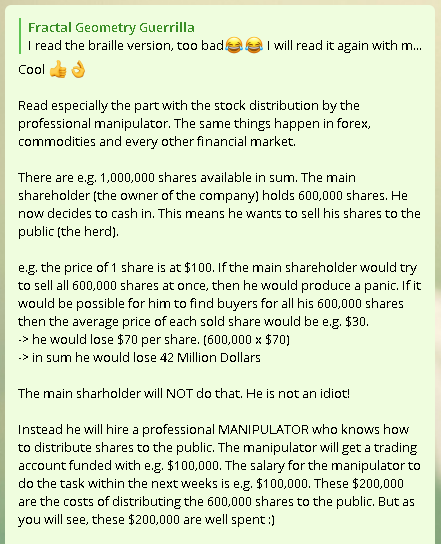 But the staff of investing.com needed 8 hours to review my analysis and press the publish button. This reaction time is far too slow for my analysis and preferred time frames. So probably this was my first and only analysis on investing.com. 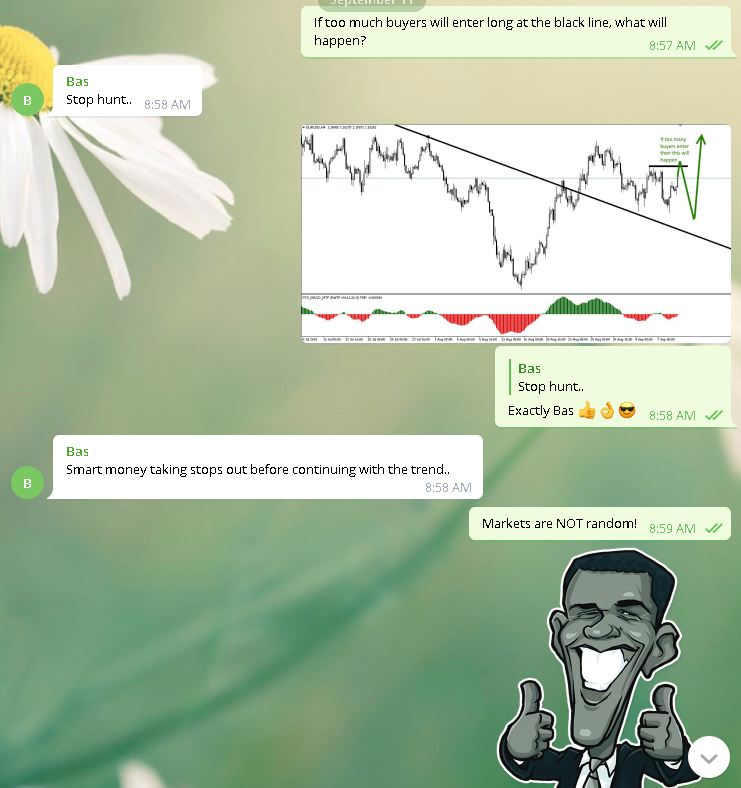 In this blog post I will give further explanations to the latest 3 live trade calls that I made in the telegram group. 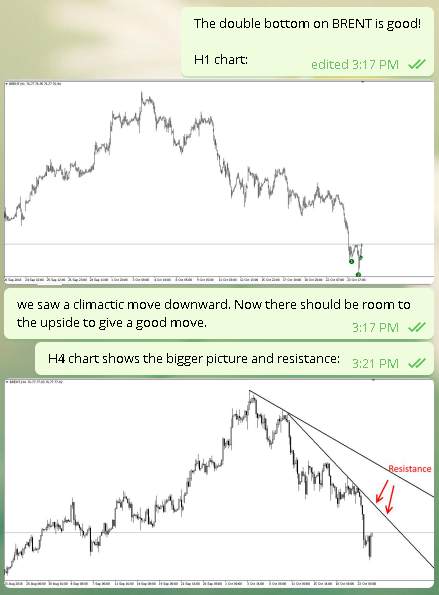 I called these trade live in the telegram group and gave a lot of explanations why these trade setups were especially good. 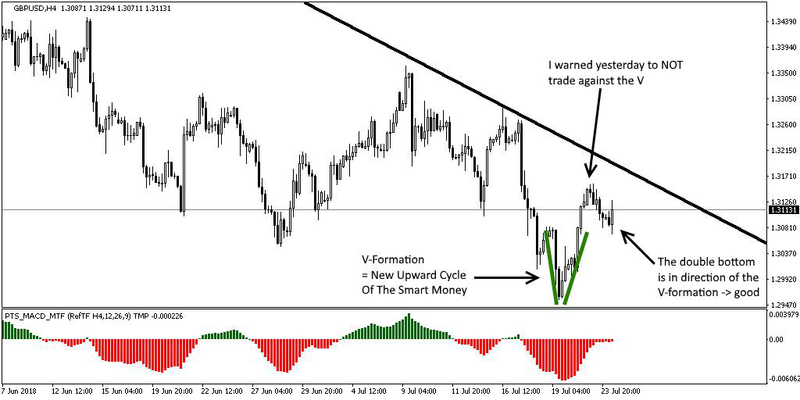 As you will see, a lot of things are always repeating on every instrument and on every time frame. Therefore, read carefully and maybe multiple times until you completely understood what I have written! 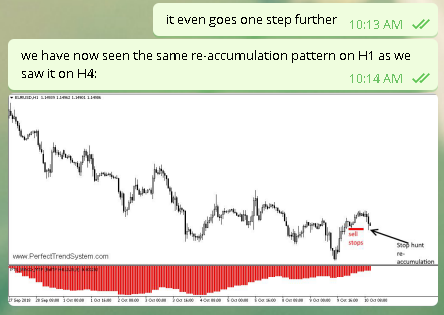 As you can see, I compared the actual long setup on H1 with a long setup that occurred some weeks ago on H4. 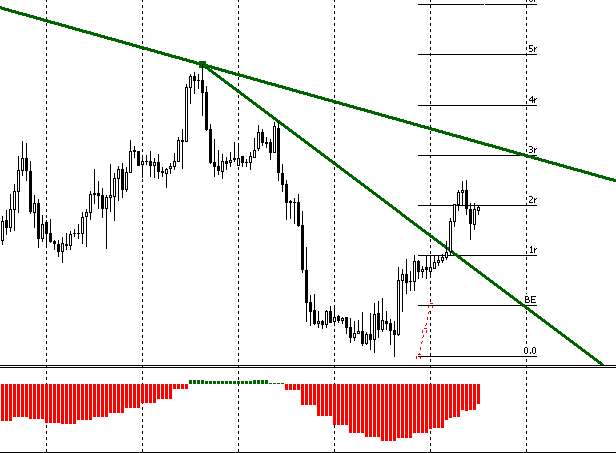 Both setups occurred after a matured downward trend and both setups are showing a preceding V-pattern. 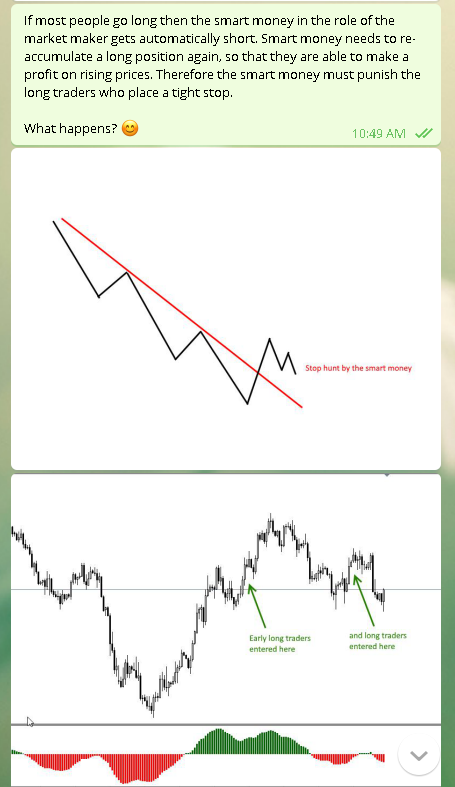 Also in both cases the V-pattern broke the descending trend line. 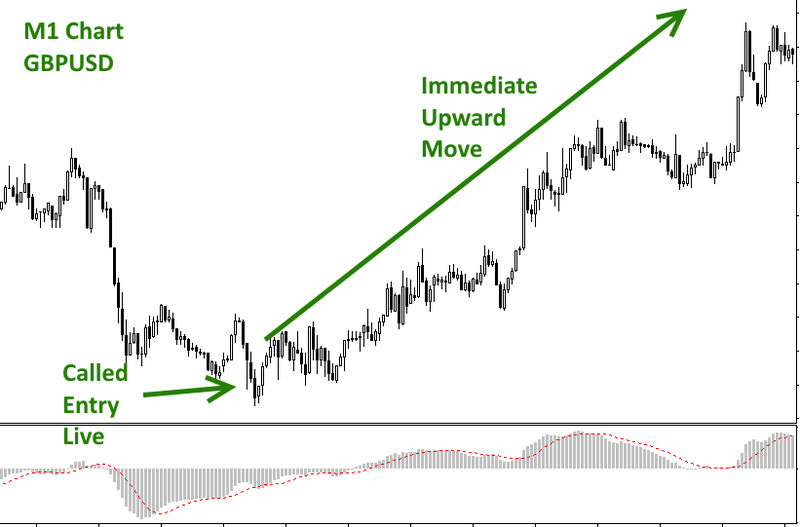 Such setups are very good and you will see them over and over again. 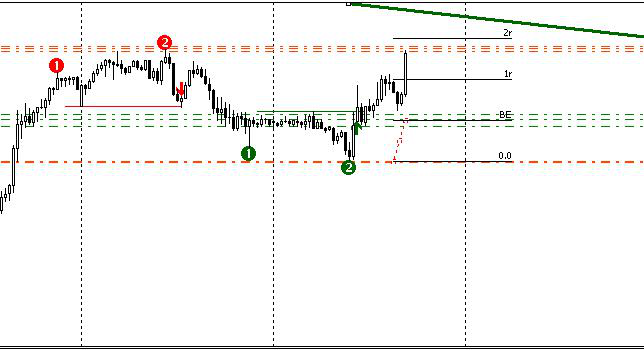 We will now dig deeper into the entry timing of this long setup. 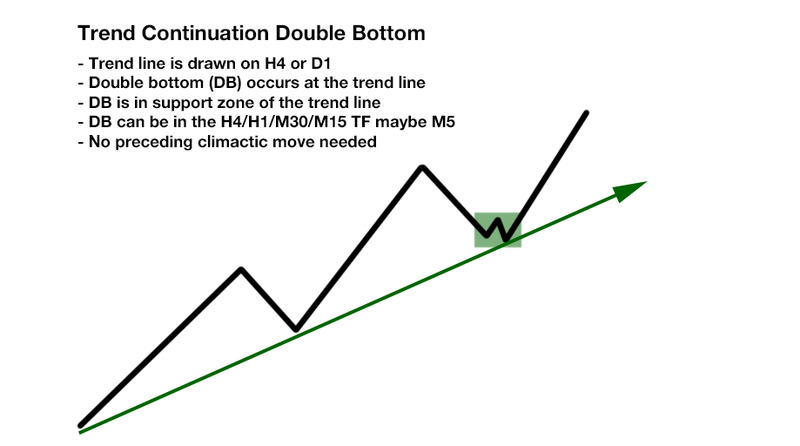 Why is the price pulling back near to the trend line and developing a double bottom pattern? 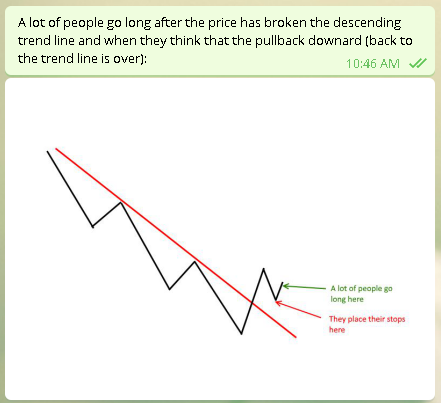 After the trend line was broken to the upside a lot of traders of the herd entered long. 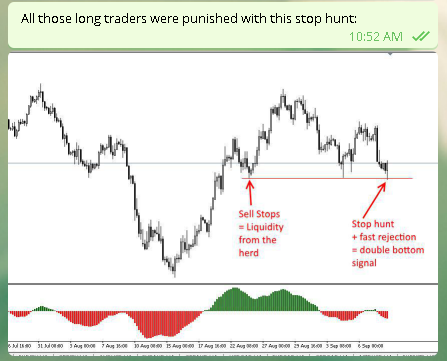 Many of them who trade with a tight stop distance place the stops directly behind a recent low. 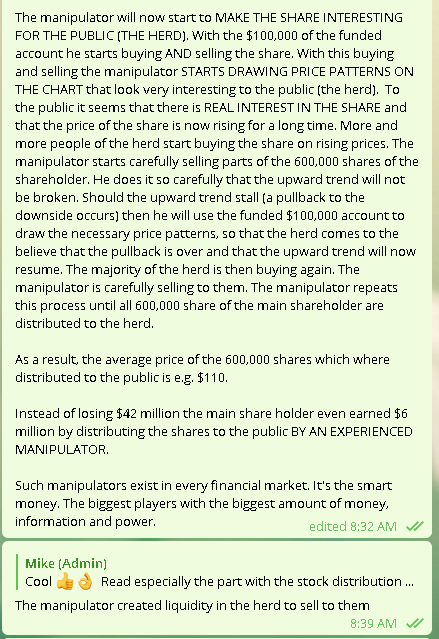 The smart money knows these levels and drives the price directly into the sells stops of the herd. 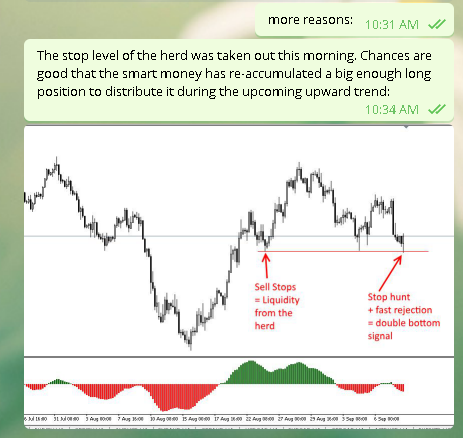 As soon as the price level of the sell stops is reached the smart money absorbs all incoming short orders (accumulates more long orders). 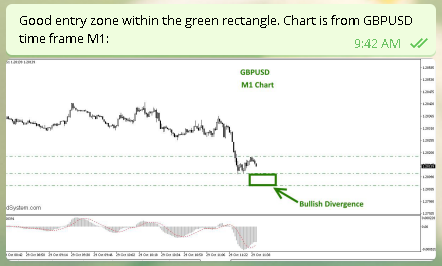 The trade quickly reached my target zone which was near a recent high which acts as a resistance. 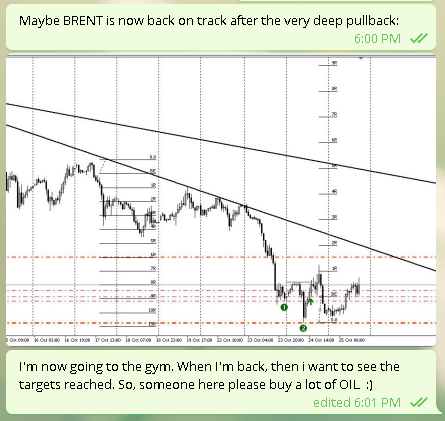 The long trade on Brent that i called live was good, but it had not the extraordinary quality as the EURUSD trade explained above. 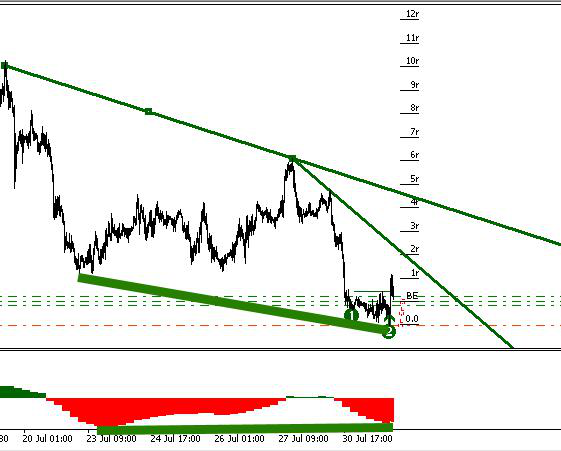 There was no broken trend line, no preceding bigger V and there was no bullish divergence. 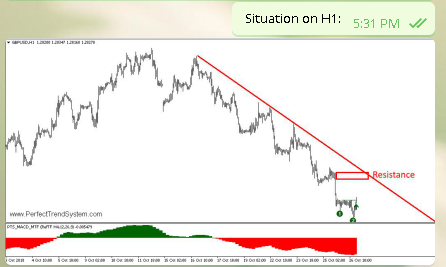 The climactic downward move produced a strong oversold situation and a lot of space to the descending downward trend line, which acts as resistance. 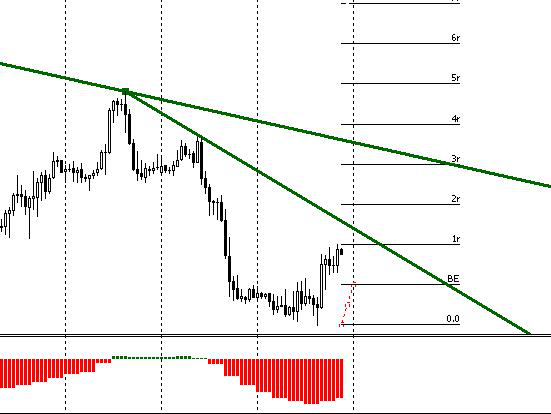 The price was ready to pop up, at least into the region of the downward trend line. 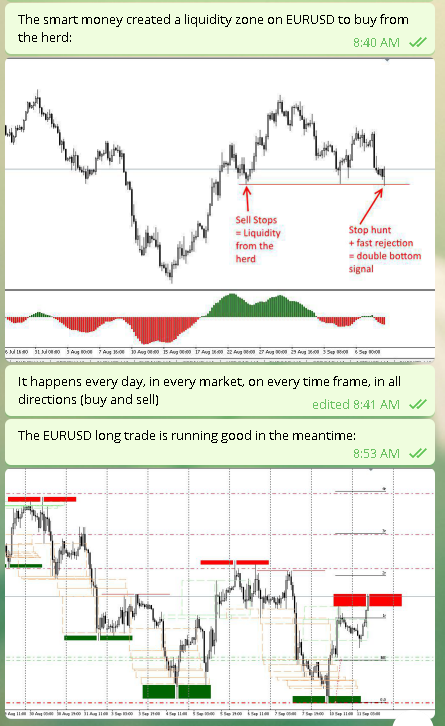 As I wrote in the telegram group, depending on the entry price your winning trade will have a different size (expressed in R -> 1R = Risk of trade). 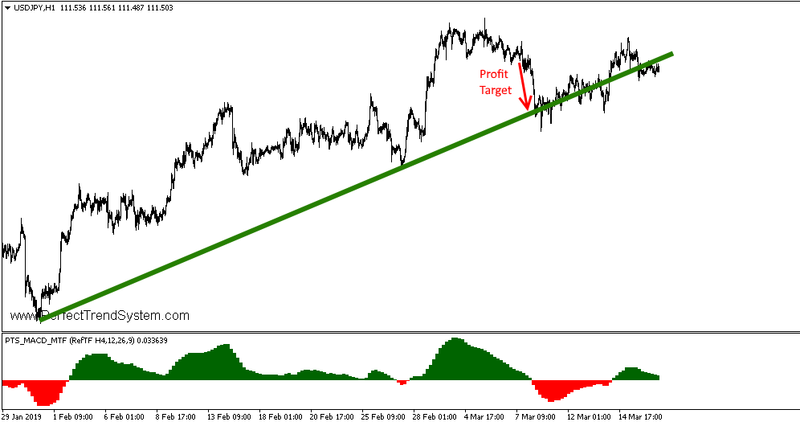 If you enter directly after the double bottom signal occurred, then the distance to the descending trend line could give a 1R winner at maximum. 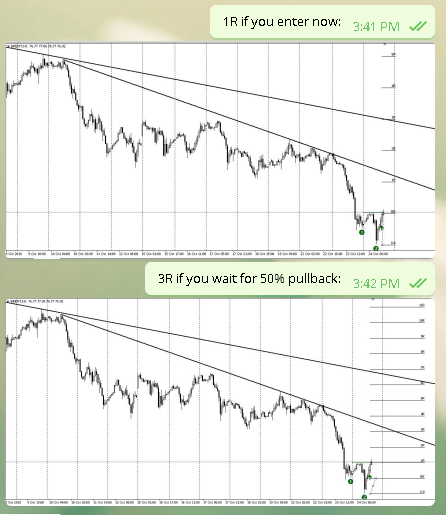 If you wait for a 50% pullback (better entry price) then your winner can get even 3R until the descending trend line is reached. 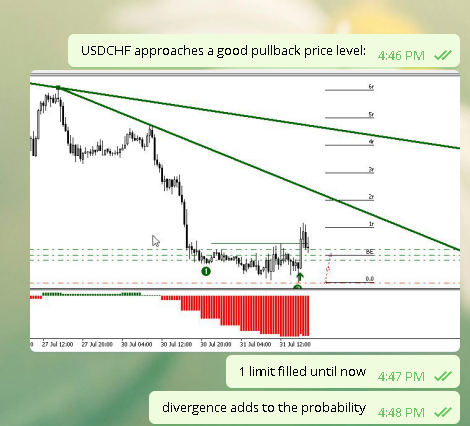 As I do it most of the time with my trades (and because the trade had not the absolute best quality -> no divergence, no broken trend line, no preceding bigger V), I placed limit orders and waited for a pullback. 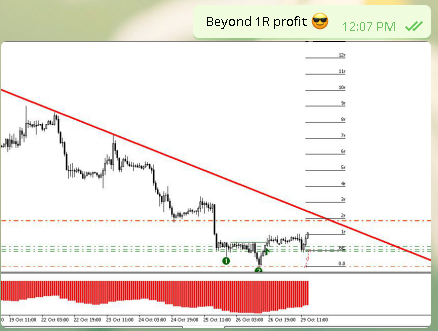 My limit order entries gave me a theoretical maximum of a 2R winning trade until the descending trend line will be reached. On the next day, which was a Friday, the price started to make the upward move. But now, 1 day later, the descending trend line was even nearer to the actual price. The maximum possible winner was only 1.3R. 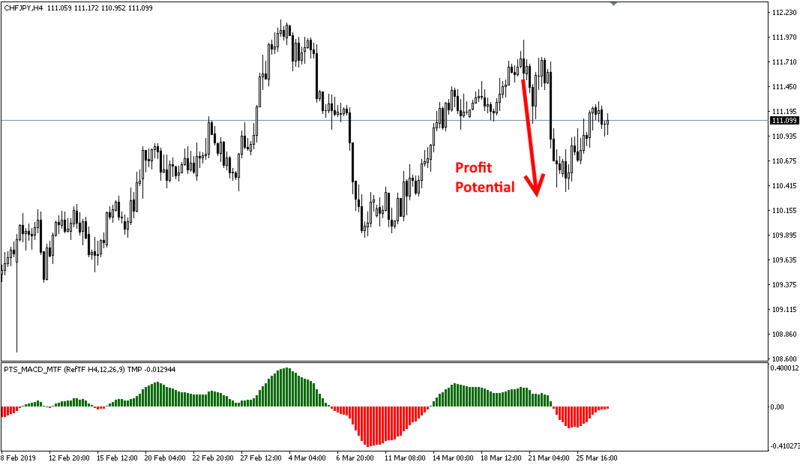 Because it was late in the trading day on a Friday (and i don't want to hold during the weekend) I decided to adjust the targets to around 0.8R profit. 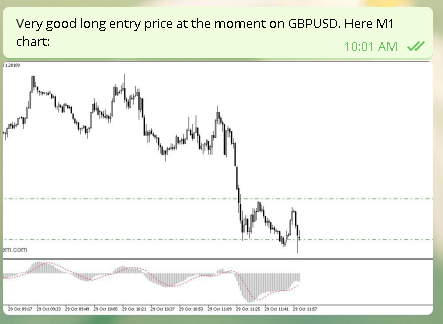 The third trade that I called live was a double bottom on GBPUSD H1 late on a Friday. Therefore I said I will search for a good entry opportunity on Monday. 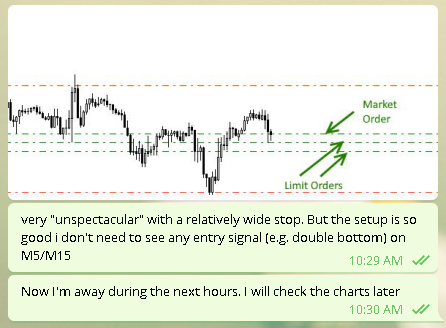 The downward move into this zone (the area of my limit orders) occurred as expected. 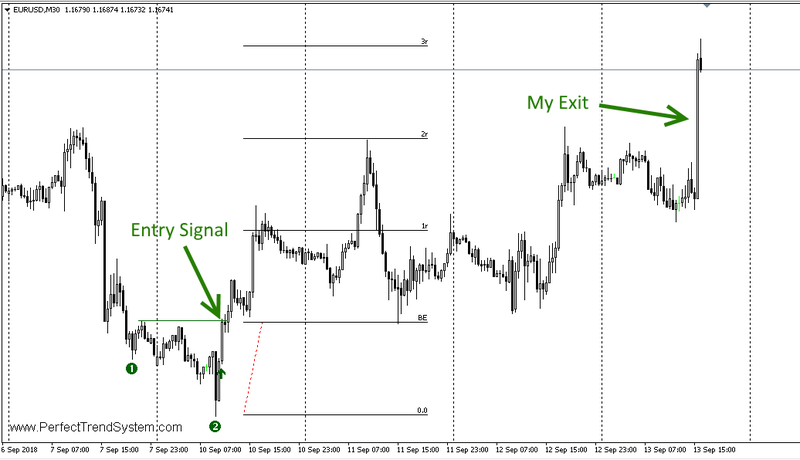 The following chart shows the time frame M1. I posted a chart of this small time frame because the downward move into the sell-stop zone of the herd was done very fast. 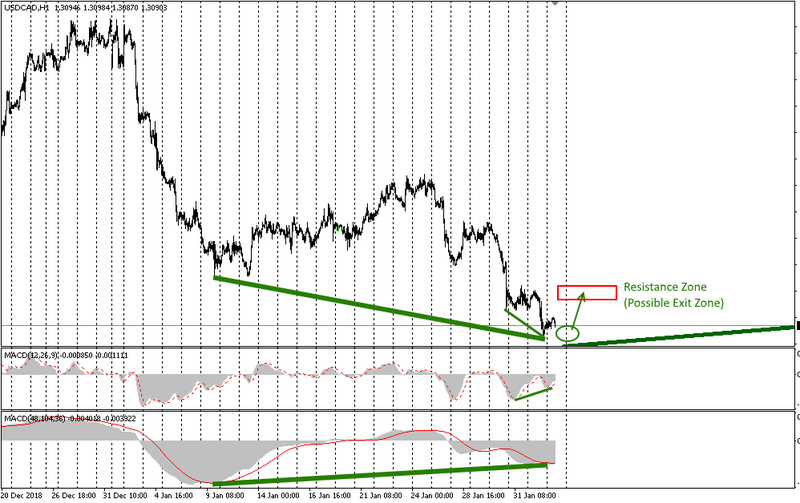 After such a fast downward move a bullish divergence must develop. 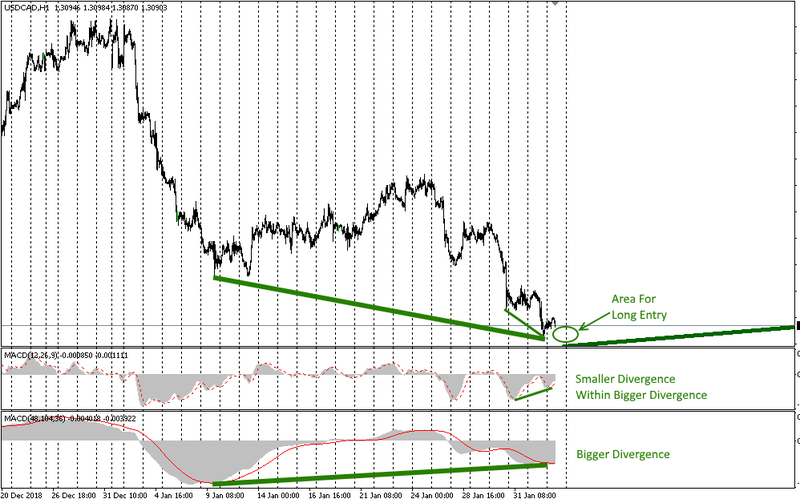 Entering within the divergence can give you entries at the best price of the day! 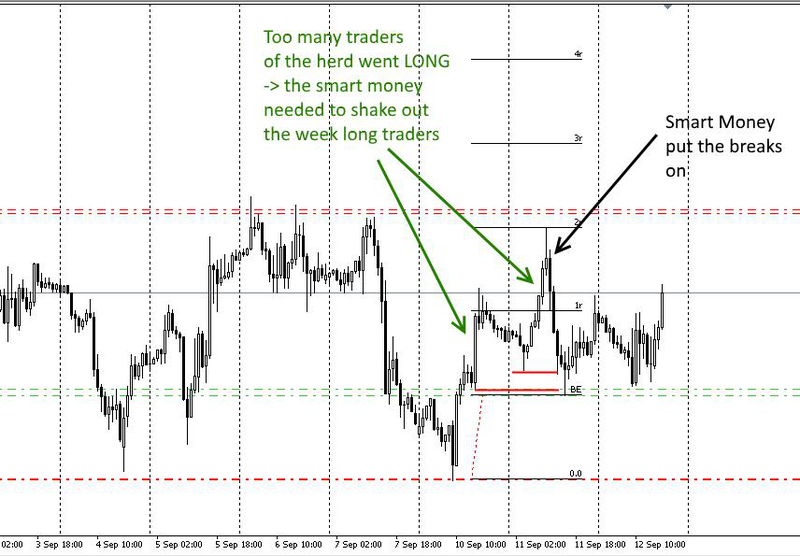 The smart money put the breaks on and did a final bigger stop hunt below my stop price level. 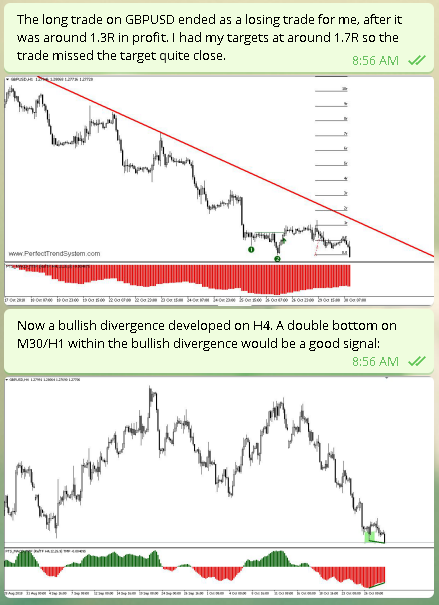 After the final stop hunt by the smart money (and after the bullish divergence developed) the price shoot up as expected. So my initial analysis "A big reversal is ahead because of USD weakness" was correct. 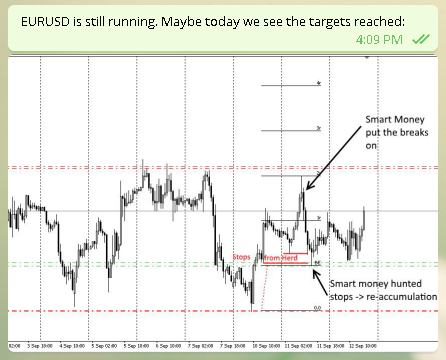 I was victim of a final stop hunt by the smart money and could not make money from my this reversal. 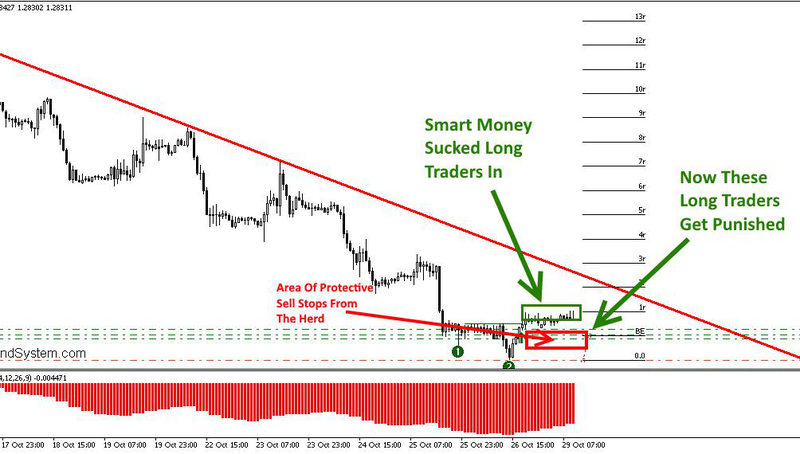 This highest quality EURUSD long trade can help you to think like a professional trader. 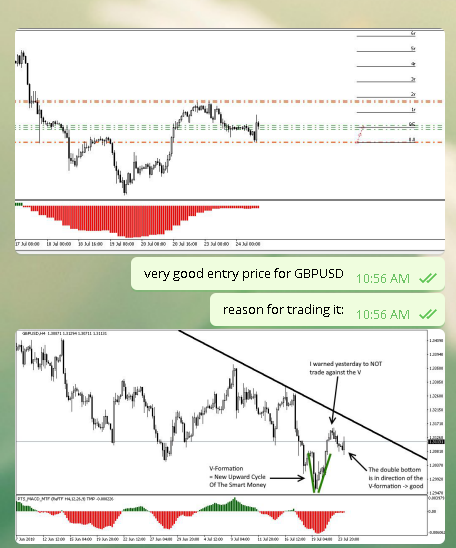 I called this trade live in the telegram group and gave a lot of explanations why this trade was so especially good. We will now see in detail, why this trade was of highest quality. 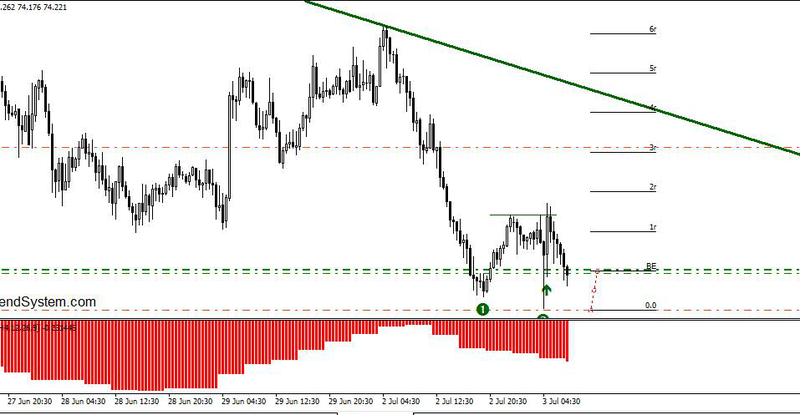 In the moment when the signal came I directly knew that this is one of the best setups of the last weeks! 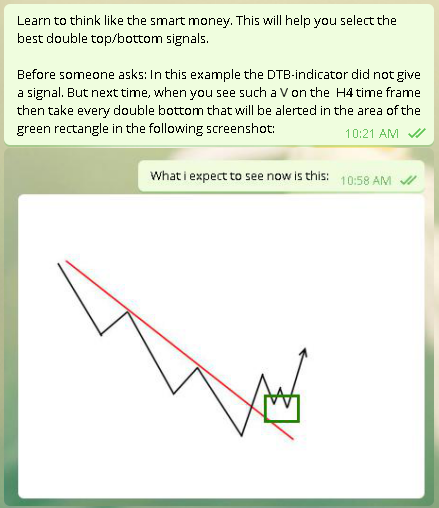 And the confluence of these 3 edges in the moment of the double bottom signal made this setup a perfect highest quality setup! 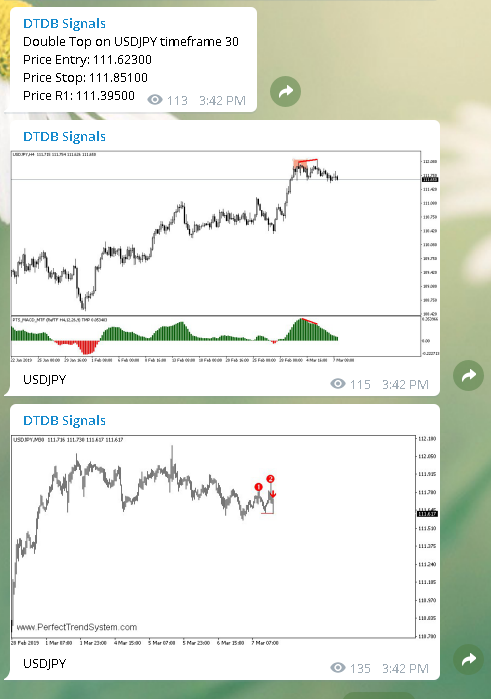 You can receive these signals in real-time with the telegram signal service or if you run the alerter indicator on your own computer. 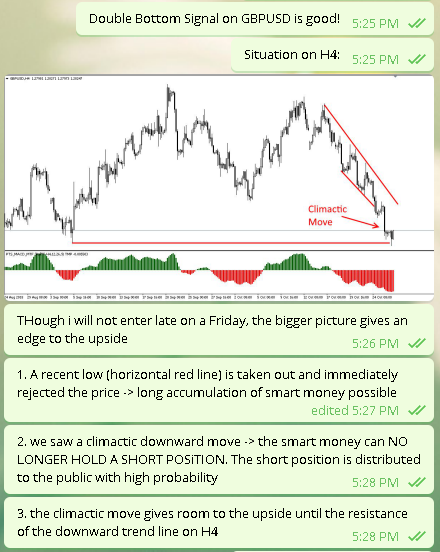 Also, please join the free telegram group and learn from experienced traders there. 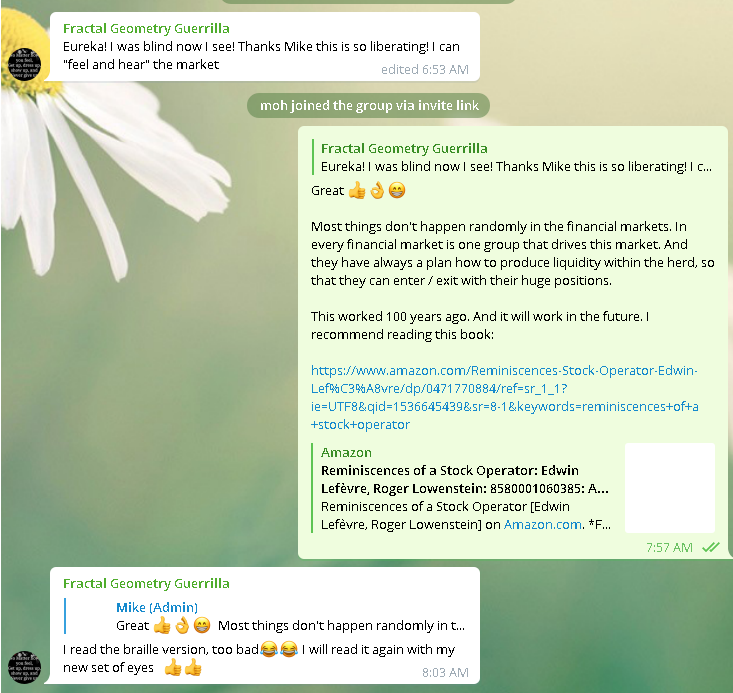 During the last month I posted 4 day trading setups in the telegram group in real-time. 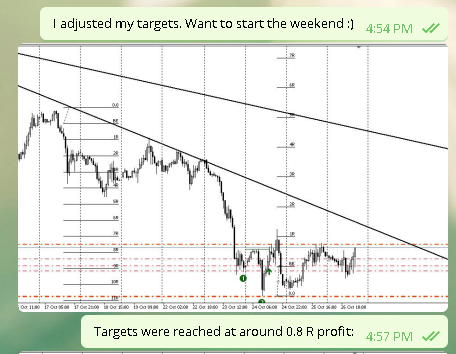 All 4 trades ended as winners and produced, with my intraday targets, 7R profit (1R = the initial risk). 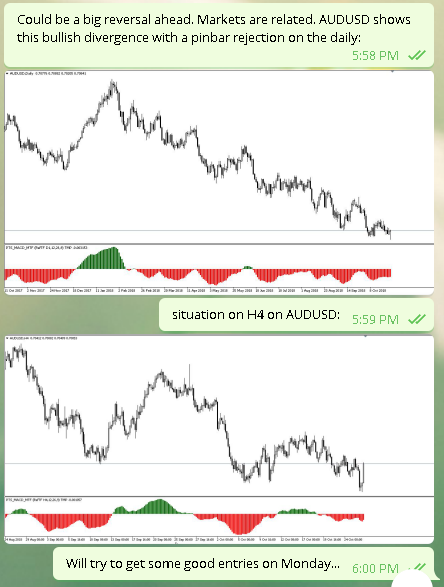 These 4 trades are only those trades which I posted live. In July were around 20 highest probability setups which you could select. 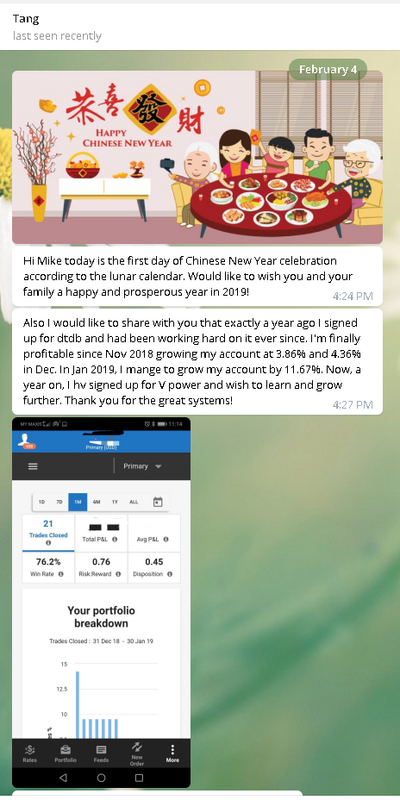 Since December I posted around 30 live trades in the telegram group. You can count the trades which ended as losing trades on one hand. 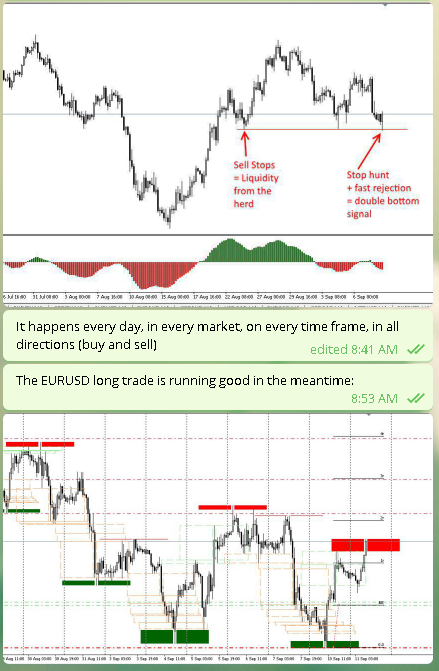 You can check all trades by scrolling back and learn from my explanations. 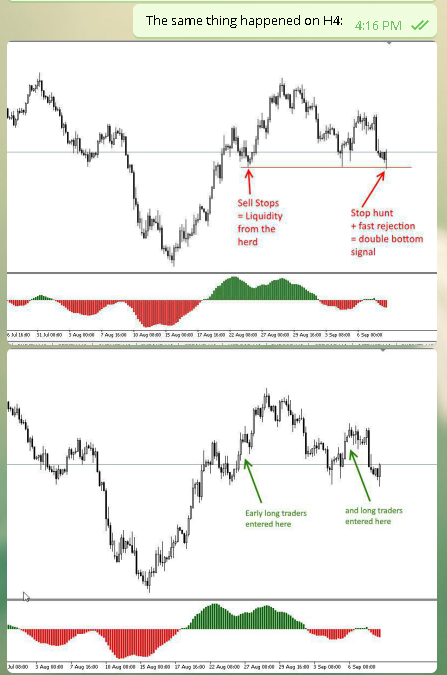 Learning from these setups will give you the conviction that the Double Top/Bottom concept is all you need to get profitable. 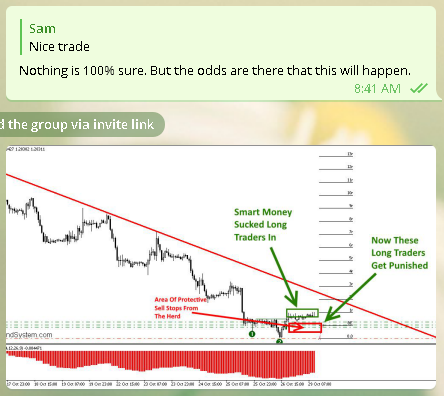 I already explained the first of the 4 trades in the previous blog post. Now I will explain my thoughts and reasons for the other 3 day trades. 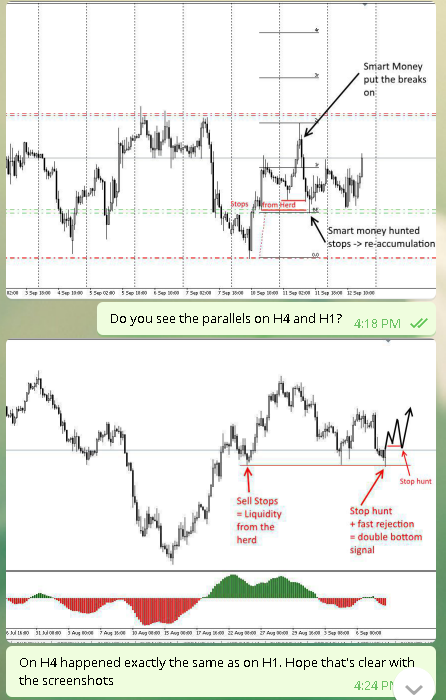 In the following screenshot you can see the H4 time frame and the V-formation. 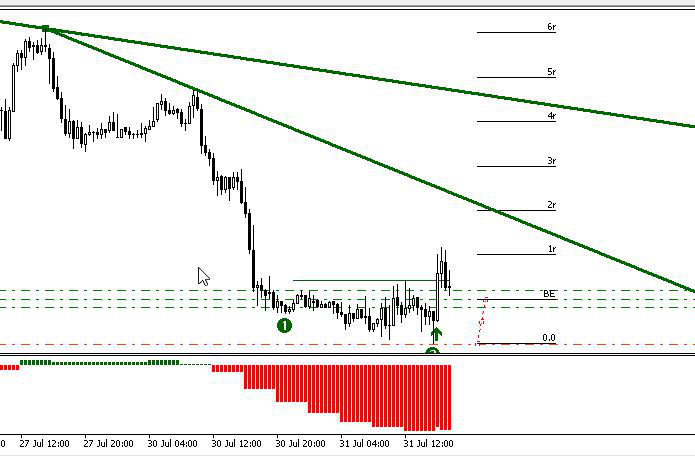 A V-formation on H4 within a downward trend where the lowest low of the V is also the lowest low of the downward trend is a powerful setup. 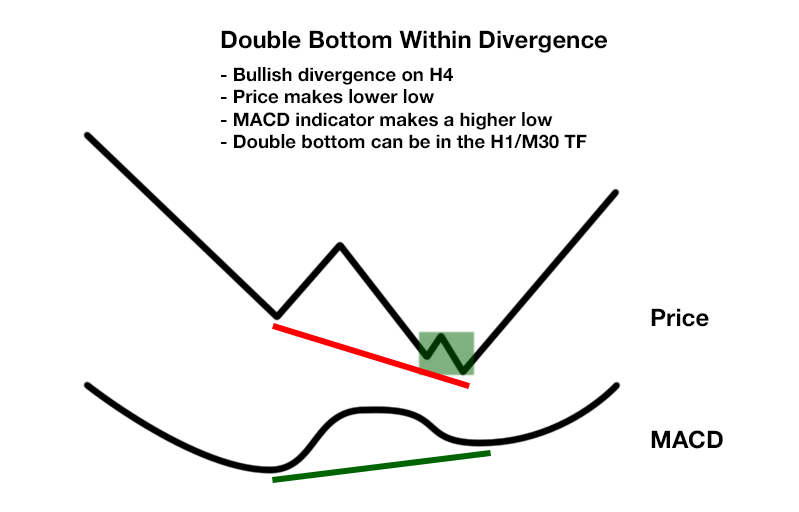 Double bottoms during the first pullback of the V are high probability setups! 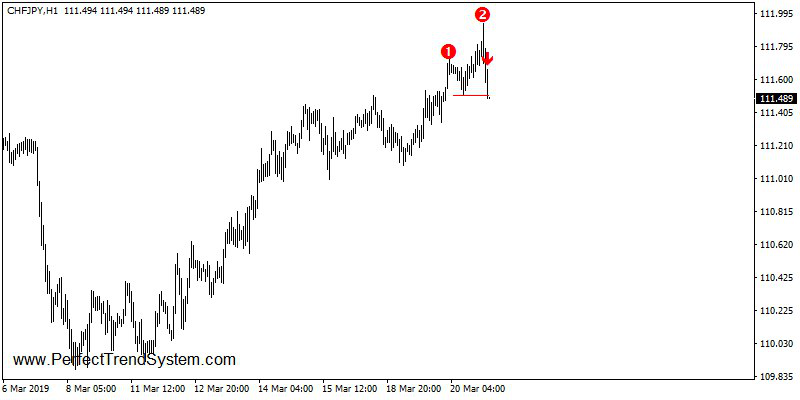 A few members of the group took the double top on GBPUSD on the day before the double bottom occurred (the second trade above). 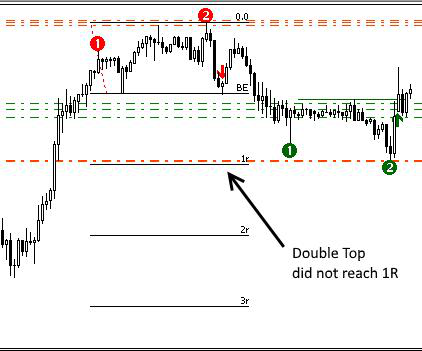 I explained that if you enter this double top at the neckline then the risk / reward of the trade is not good. 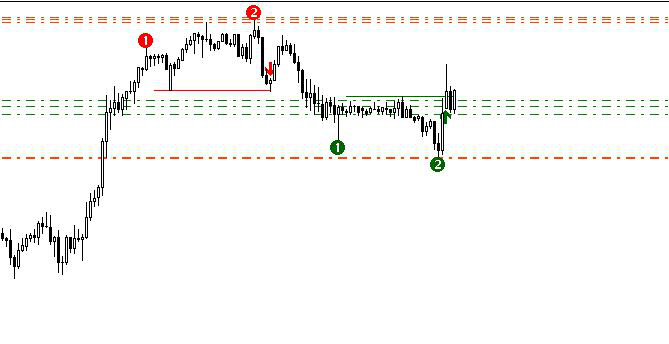 This signal had not a big profit potential because it was against the direction of the bullish V on H4. 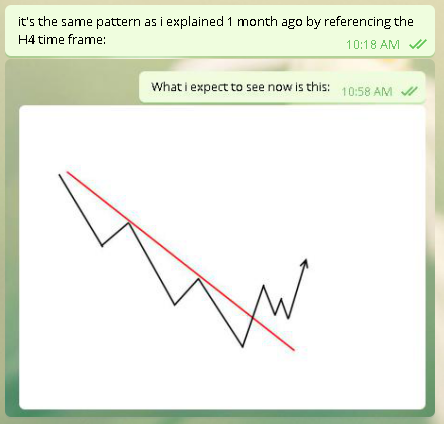 One day later traded this concept "waiting for a pullback to transform a bad signal into a good signal" live in the telegram group. 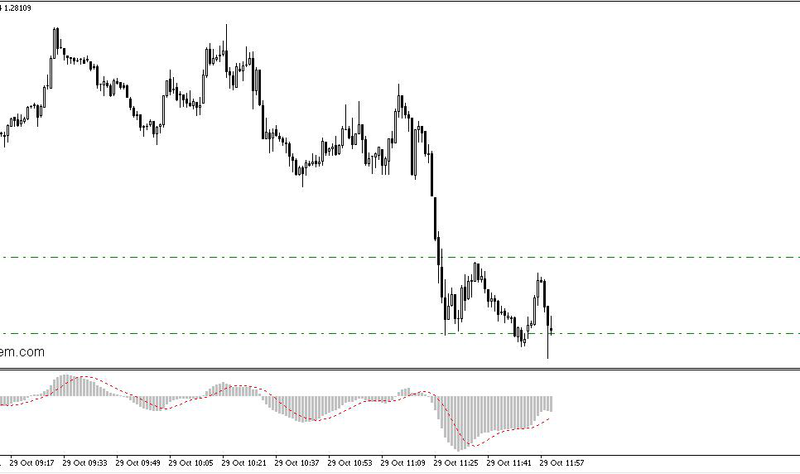 There was a double bottom on EURGBP on M30. There was no support from the bigger picture for this signal. We would never enter such signals directly at the neckline. But after a pullback of 50% (to the middle between the neckline and the lowest low of the double bottom) the signal had now a very good risk / reward and was a tradeable signal. It was still not an extremely good signal but it was now a signal with a good edge. The trend channel (resistance) was far enough away to give a big enough move to the upside. 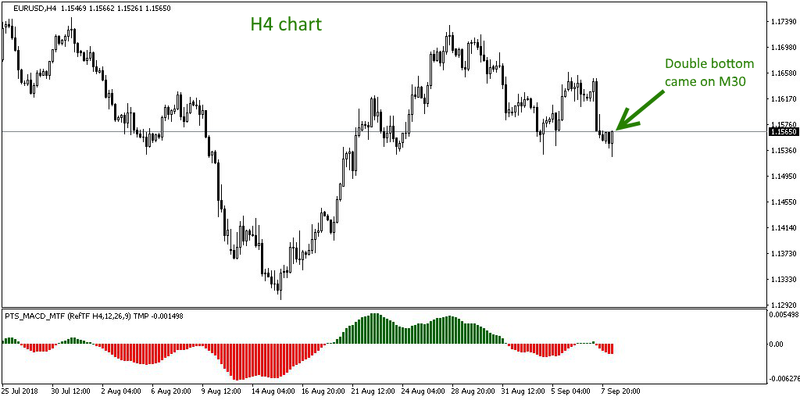 Last week while I was on holiday in Croatia we got two signals of type "H4 divergence + M30/H1 Double Top/Bottom". 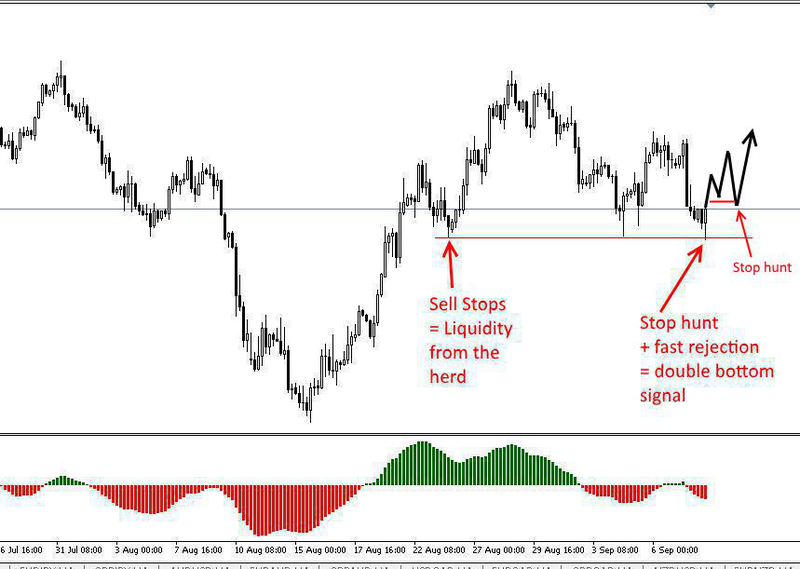 One signal on NZDJPY and one on Gold. 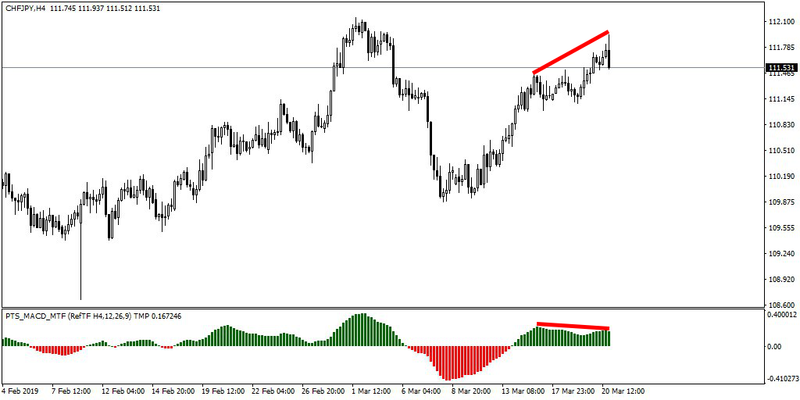 Both signals were double bottoms within a bullish divergence. 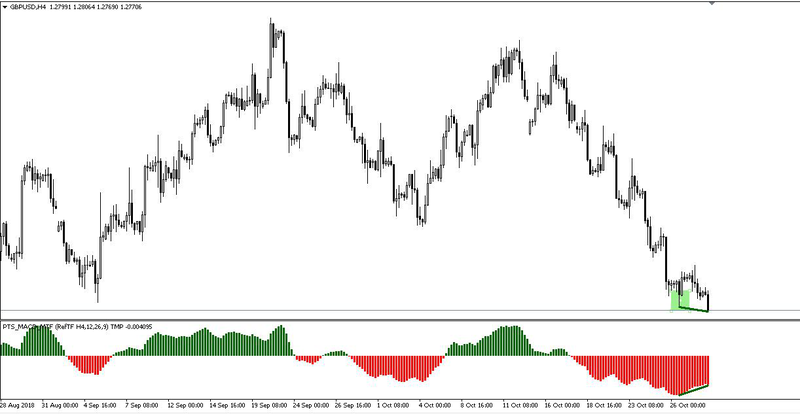 The signal on NZDJPY came at 4:30am. I was sleeping at that time. 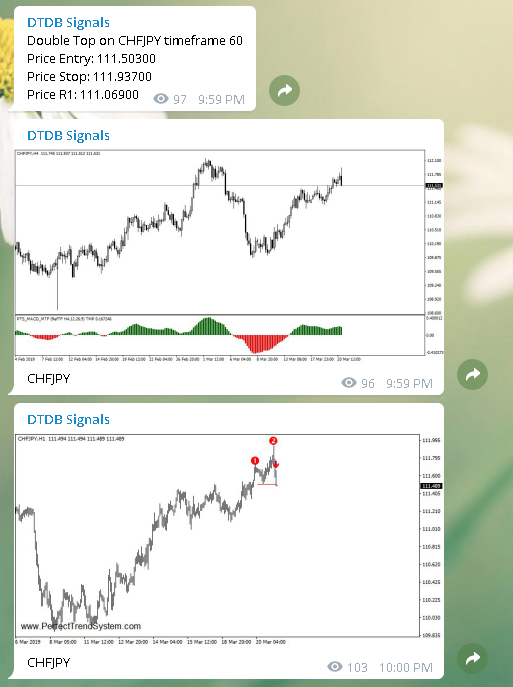 The following two screenshots show how the signal was automatically sent in real-time to the telegram channels of the signal service. I woke up around 3 hours after the signal occurred and checked the charts. 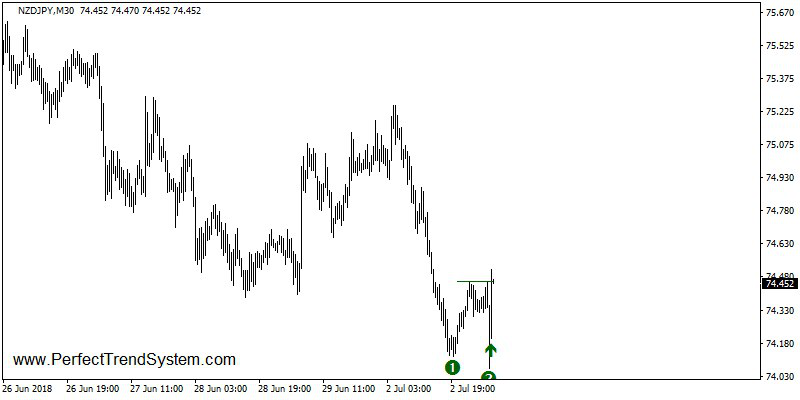 I saw that there was a nice deep pullback after double bottom signal was alerted. 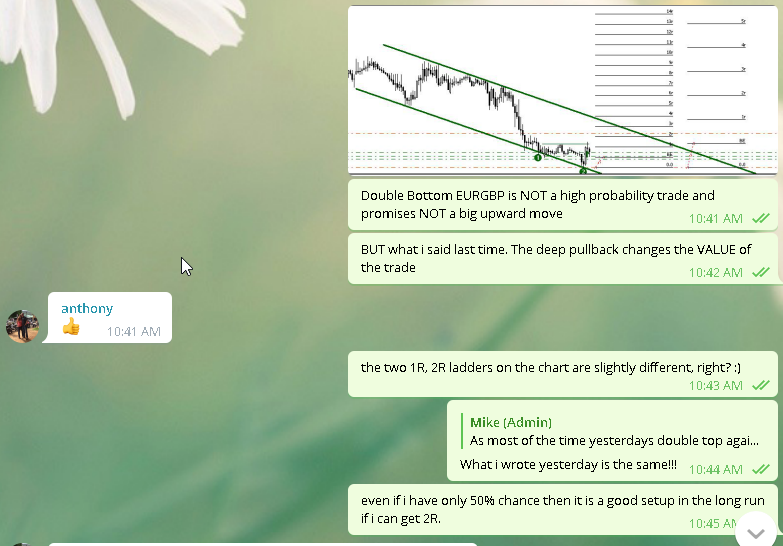 If you are a long term member of the telegram group then you already know that I love to enter within pullbacks :) Entering after a pullback gives you bigger winners because the initial risk is smaller. 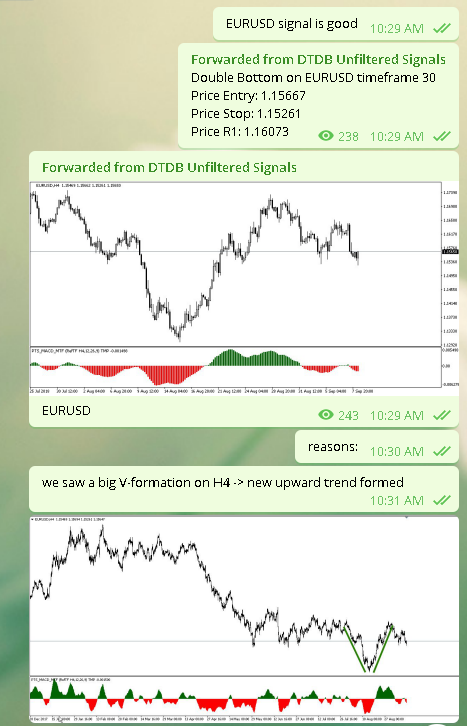 After entering the trade, as you can see in the following screenshot, I immediately posted in the telegram group that now is a good entry price for the signal. 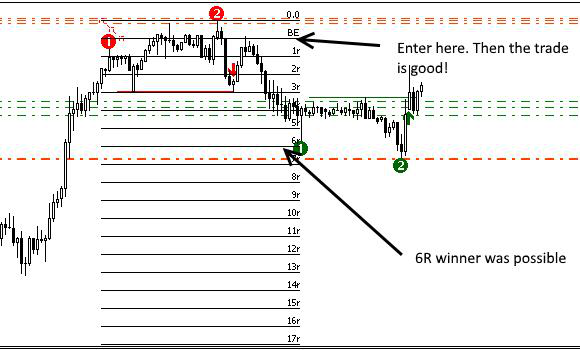 I placed the target at around 3R which means that the trade can get a winner which is 3 times bigger than if it gets a losing trade. This setup was especially good because the descending trend line of the matured trend (in the following screenshot) gave enough room for a big winning move to the upside. 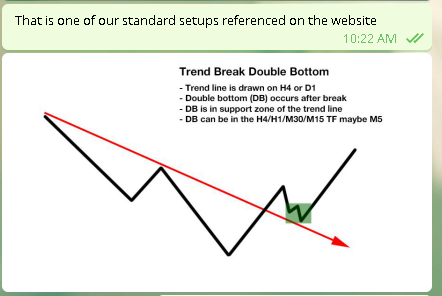 Remember: Trend line act as support and resistance. 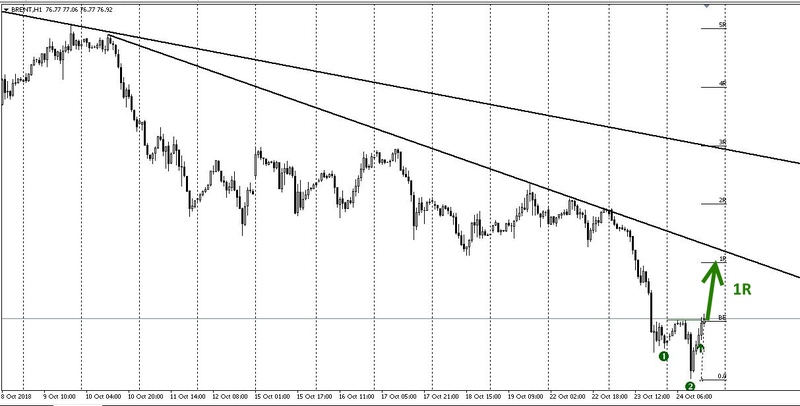 In this case the trend line acts as resistance and it's a good idea to exit a trade before a major resistance zone. Of course you can go for bigger targets and anticipate that the trend line will be broken. But please be prepared for a much lower winning percentage if you go for targets which are farther away. In the following screenshot you can see that the target at 3R was reached on the same day. 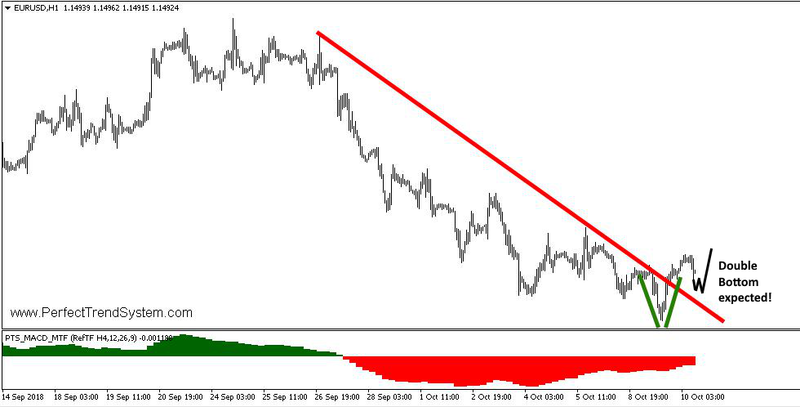 The upward move after the signal even broke the descending trend line. The trade could have ended as an 11R winner. But I am satisfied with the 3R. I really like to trade with a higher winning percentage. 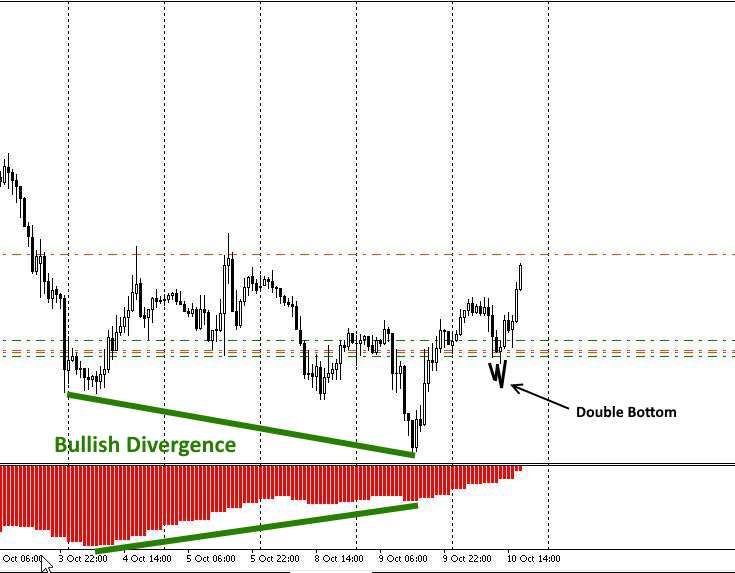 As you will see with time, all "H4 divergence + M30/H1 Double Top/Bottom"-setups will look similarly. 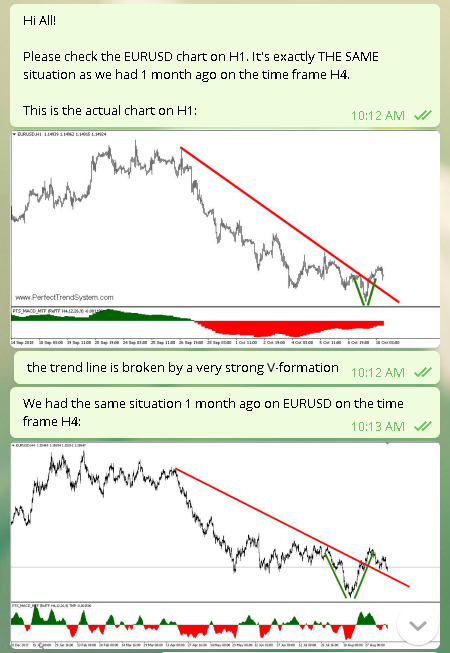 At every setup we will have a trend line which is in the way of our trading direction. 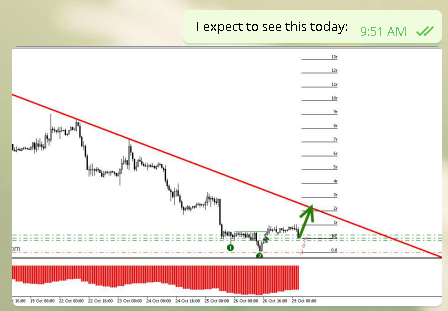 The distance of this trend line can be a criteria to define the risk/reward of the trade and help to decide to enter or skip the setup. 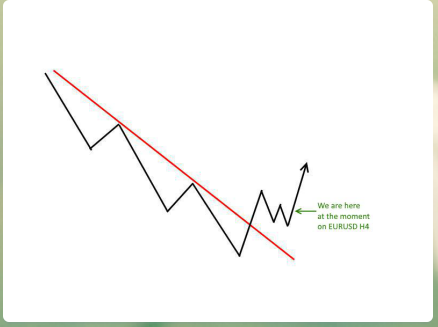 Sometimes this trend line will already be broken after the signal occurred. Then it makes sense to look for horizontal support/resistance areas.